Born in Tipperary, Ireland, Agnes Henry was to later inform historian of anarchism Max Nettlau in the questionnaire that he sent to English and foreign anarchists that from her youth she had participated in movements to alleviate suffering . She was described by Nettlau as being a “lively little lady”. She is described in one account of an anarchist demonstration as wearing a yellow ulster and cloth shoes and plodding along “indefatigably”. Most of her life was spent studying kindergarten theory, which she regarded as essentially anarchist. In the 1880s she ran a kindergarten in Trinidad. In anarchist newspaper Freedom of July 1887 there appeared an article by her arguing against the prohibition of women workers from the pit brow (The 1886 Mines Regulation Bill). She went for a while to Italy and as a result of her experiences there was able to write an article for Freedom “How Italian Risings are Promoted and Suppressed by the Italian Government” in July 1891. It would appear that she got to know various leading lights in the Italian anarchist movement like Errico Malatesta and the lawyer Saverio Merlino. In 1890 she translated a collected of fairy tales by the German writer Wilhelm Hauff entitled The Cold Heart. This book was used in many schools. She participated in an experiment in communal living at 29 Doughty Street, near Mecklenburgh Square, Bloomsbury at the Fellowship House until it closed in 1892. It had been set up by the Fellowship of the New Life, a group which advocated a more ethical approach to life and “the cultivation of a new character in all." Other members included Edward Carpenter and Havelock Ellis. The Fabian Society emerged from this group. There she shared a household with future Labour leader and turncoat James Ramsay MacDonald. The lodgers had their own rooms and ate meals together in the basement (a normal thing today, but considered highly advanced in this period). Apparently she annoyed other lodgers by wanting to discuss anarchism over breakfast!! Malatesta made frequent visits to discuss anarchism with her at this address. She then moved to St. Augustine’s Road, Camden. Here Freedom set up office in February 1893 with the printer William Wess moving there with the type. Freedom’s office was in the damp basement which had a bad effect on Wess’s health so the composing was moved . Together with Paris communard Louise Michel she ran the International School in Fitzrovia at 19 Fitzroy Square. She wrote Women under Socialism in March 1892 and gave a “Wednesday lecture” at the Hall of Science in London on Women’s Position under Anarchy. She opposed State maternity support. She was to say that: “In anarchism I see the only base for women to escape marriage without love and obligatory maternity and the degrading laws and servile customs to which women of all classes have been subjected for so long”. 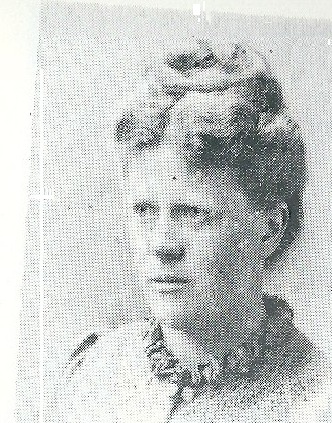 In April 1893 she went on a speaking tour to Scotland to promote anarchism . When Alfred Foster , an unemployed activist and anarchist, was arrested in Peckham in March 1894 she offered to put up bail but was rejected because she was a woman. In November 1895 she was due to lecture on anarchism to the Birmingham branch of the Independent Labour Party but this invitation was withdrawn because the Party feared that “she might advocate violence”. She adopted a young girl Adelaide, with an age variously given as six or eight, whom Nettlau described as “run wild”. This was the daughter of the Italian anarchist Antonio Agresti, who was then able to marry Olive Rossetti and move to Italy (both these former anarchists ended up as avid supporters of Mussolini). Around this time, in January 1895 she moved to Paris and then from June of that year until March 1896 lived in Pont Aven in Britanny, trying to earn a living by teaching and by translating. The Decadent poet Ernest Dowson records encountering Henry and the child there. She returned to England in April 1896. In a letter in Seed-Time, magazine of the Fellowship she said that she would be “exceedingly glad” to meet a small family to share a house with her in North Walsham “if possible in the Associated Home System” that had been adopted by Fellowship House. She had to move to find a suitable school for the child, which was Suffield Park Girls School in Cromer which disapproved of competition. In 1896 she published Anarchist Communism in Relation to State Socialism put out by James Tochatti’s Liberty Press . In September of the same year she brought out The Probable Evolution of British Socialism Tomorrow. The same year she was deeply involved in the activities of the Associated Anarchists founded by Carl Quinn which made an effort to develop effective organisation within the British anarchist movement. As a result she moved away from the group around Freedom. Unfortunately the Associated Anarchists were only able to bring out a few issues of their paper Alarm and fell apart within a year. Also in 1896 she attended the Congress of the Second International held in London , acting as a delegate for French syndicalists unable to attend, along with Archie Gorrie, John Bullas, Alf Barton, J. Welsh and John Headley. In April 1897 a letter from Agnes Henry appeared in the paper of the Independent Labour Party, The Labour Leader , in which she stated that it had almost persuaded her to join the ILP. In July she explained that she was now anxious to join it, rather feebly justifying her decision as an Anarchist Communist to join a political and parliamentarian party. George Robertson, an Edinburgh anarchist, was to reply that “you can take part in no political contest without renouncing your claim to Anarchism”. The Italian anarchist Merlino’s move to reformism seems to have influenced her. She was one of quite a few anarchists in this period to move over to the ILP , representing some loss of nerve within the movement (others were Archibald Gorrie and a while later Tom Barclay, both of Leicester, John Headley of Great Yarmouth, Alf Barton, W.B. Parker, Tom Pearson, John Paton etc.) Other indications of this demoralisation were the collapse of both open-air and printed propaganda, with the movement not recovering until around 1903. Agnes Henry was listed on the Roll of Honour of Suffragette Prisoners 1905-1914 (compiled by the Suffragette Fellowship around 1950 based on recollections of participants) and appears to have been one of those arrested during the pre-WW1 actions. She felt enough allegiance to her old comrade Malatesta to speak on his behalf at Trafalgar Square , alongside anarchist speakers, when he was threatened with deportation in 1912. Becker, H. Notes on Freedom and the Freedom Press 1886-1928 in Raven No1.